I am providing the following information to help you get the best quality lumber that you can from the logs that you have. This is all based on personal experiences and extensive research on the subject. If there is something that I cannot help you with there is a large amount of information out there that should answer your questions and concerns. To get the lumber you want starts with how long you cut your logs after the trees are cut. If you are not sure about length then I would suggest that you cut the logs between 8.5ft to 20 feet long, and I would recommend leaving an extra 3 or 4 inches for squaring the ends. It is better to cut the logs in 8, 10, 12, 16, or 20 foot lengths as this makes for better stacking, drying and storing. These lengths are best suited because should the need arise, these lengths also match the measurement for standard construction. After felling and skidding your logs the ends should be sealed as soon as possible because they will start to crack. This will start to happen immediately because logs always dry from the ends inward. If any large branches were removed off of the body of the log these should be sealed as well. There is wax seals on the market, but I find that outdoor paint works good too. If there is a large amount of time to pass ( a month or more) before you are having your logs sawn, then they should be lifted up off of the ground to prevent insect infestation and decay from setting in. To do this the logs can be put up on rail road ties, landscape timbers, pipe or large blocks. It is always good to saw lumber as soon as possible after felling, but logs that have been down for an extended period of time can possibly be milled as well. There are some places that have the luxury of a kiln to dry their lumber, but in the majority of cases people just have the option of air drying. Before you have the lumber milled, make sure to prepare your drying area in a place that will be protected from direct exposure to sun, rain or snow. The spacers in between the boards are called stickers and you will need quite a few of them. I would recommend ones made of dry solid wood, or plywood. Anything wet will leave marks on your lumber and over time cause mild rot. For obvious reasons your stickers should be at least as long as the width of the stack of lumber. From personal experience and reading most stacks are 3 to 4 feet deep and a taller/ narrower stack works better than a shorter/wider rack. This provides a good concentration of weight in the right places and keeps your boards straighter. The amount of stickers per layer that you will need will depend on how long the boards are. Recommended space between each sticker is 12 to 24 inches and at both ends. 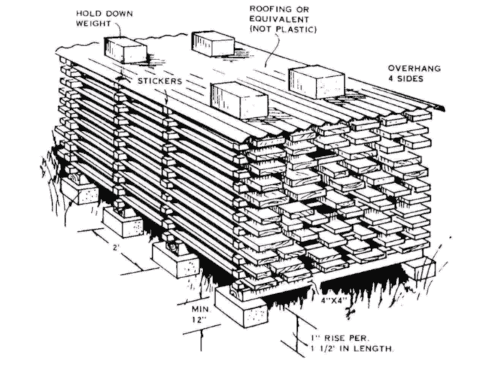 You can calculate how many you will require by taking into account how long your lumber is, how high you are stacking and how many stacks there will be. For the base of your stack, make sure the ground/surface is as level as possible. Pressure treated or very dry 4 x 4's usually work the best. Three 8 foot pieces spread about 16 inches apart is usually adequate(can be milled on site before we start). You can place a layer of freshly sawn lumber over the 4 x 4's and make sure the ends are supported, then begin stacking from there. It is always best to have some of your stickers in line with your supporting 4 x 4's throughout the height of the stack. When placing stickers in your layers of lumber make sure that they are in the same place throughout the height of the stack. The stickers should form a vertical line upwards when viewed from the side. It is usually better to stack your lower quality boards on the top of the stack and reserve your best boards for the bottom. When you complete a stack, put your stickers in their line on the top layer of boards and then you can cover your lumber with other dried board, plywood, or a piece of sheet metal works really good especially if your have to stack outside where lumber will be exposed to the elements. Whatever you cover your lumber with make sure it is well weighted down. I do not recommend the use of a tarp as they tend to block air flow which can cause mould to develop in the stack. Lumber should be stored indoors if possible a couple of weeks before using it for any indoor projects.